Only two weeks left to get organized for a fresh start on the New Year. At least, that’s usually my plan. Try to get organized so I’ll have a fresh start on the New Year. It hardly ever works out the way I can see it in my head. It’s a fresh start all right, but never as organized as I’d like. But I get a little closer every year! And I’ll keep trying . . . I hope you’re done with all the things you were making for Christmas gifts by now, and if you’re like me, it left a bit of a mess behind. It’s a good time to clean that up, so our way is clear for all the new projects we want to start! Here’s this week’s shot of my cutting table! It looks better than last week, and part of the reason is because this morning, I shipped off my last three Christmas commissions! Woohoo! Oh, the relief that brings. So all the pieces and parts of those jobs, and the jobs themselves, are gone. Those things were taking up quite a bit of room on my table, and with them out of the way, it’s time to work on the rest of the stuff that’s hanging around on that surface. I find this photo so amusing because you can see that I’ve cleared work areas on both ends, yet I have this massive pile of stuff right in the middle! What is wrong with me? Don’t answer that. I’m really, really hoping that next week’s picture is a beautiful, clean, clear surface with maybe only one current project in view — check back — I’m gonna try hard to make that happen! 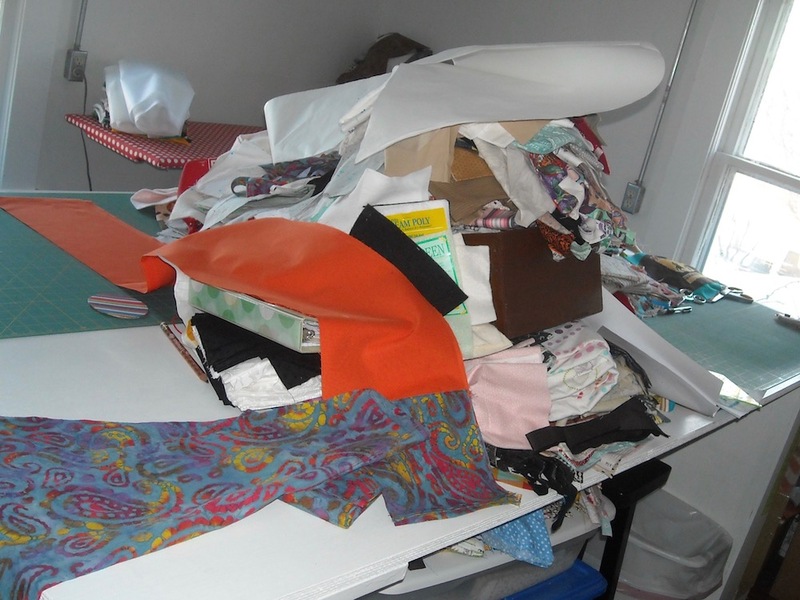 Did your Christmas preparations leave you with a mess in your sewing area? Do you have things that need to be put away? Or have you already done it because you put everything away every time? I so want to be that person, but I’m not there just yet! I was doing some of this today. I had ro clean up part of my cutting table and all around the sewing machine I quilt with to get the project sandwiched and quilted last week. It went in the mail Thursday and we left Friday morning by 8am. That leaving time was great as it was before most of the ice. Now to keep the cleared areas clear. Time will tell. I had it cleaned up, then I started working on projects and now it’s messy again. Between the mess and my cat, I have very little ironing space. Haha. The cat gets so close to my iron he actually singed part of his hair awhile ago. I have learned to move him or the iron if he’s getting too close. Sheesh. Had to clear my main work surface just to work on Christmas stuff. Work will continue through Christmas Eve as we “do” Christmas Day. The last week of the year is for clean up. Messy me. I am one who likes clean and organized. Well the holidays came. Everything that isn’t Christmas was shoved into my work room. GRRR! So until Christmas is over I have only a path in my room. Can’t wait till January. You are so creative and productive! I love reading about your challenges. I’m trying hard to keep the chaos under control, too. It’s a constant struggle! I keep making rules for myself (put everything away each day, etc.) but it’s hard! Have a Merry Christmas and a blessed New Year! I took photos last week to try and humiliate myself into a clean up. It is -5 out and i am having trouble leaving the side of the wood stove.